Baseball used to be America’s past time. But there is no questioning who holds the crown now. The National Football League has become an entertainment and sports goliath, so great, that it can make a fully endorsed film about its rookie draft. Not about a Cinderella team, great coach, iconic player, or tumultuous season, but about the interworking of its offseason. Let that sink in as I review Draft Day. The film is a walking endorsement for the NFL (as if it needed it), using authentic teams, references to the actual NFL’s past, real ESPN and NFL Network analysts, and the commissioner himself. Only the players, coaches, and owners are fictitious. The Cleveland Browns (laughing stocks of the NFL to anyone who knows football) take center stage in this story, and it’s a former coach’s son, Sonny Weaver Jr. (Kevin Costner) who has the daunting task of rebuilding the franchise and making the right choice with the team’s seventh overall pick. If what I’ve written so far doesn’t resonate with you, then don’t bother seeing this movie. There are a few attempts made to help the non-football fan understand, but you’d honestly be wasting your time if you aren’t an NFL purist. 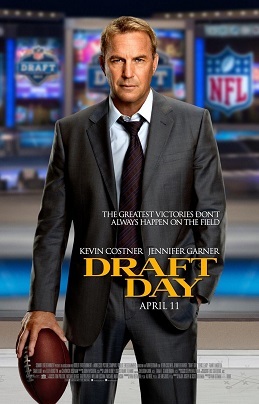 But if you are a die hard NFL fan, as I am, the movie is pretty fun. Costner humbly takes us through the chaotic and stress inducing hours that lead up to the draft. The owner (Frank Langella) has him under fire if he doesn’t make a popular fan choice by drafting the top quarterback (Josh Pence) and the new coach (Dennis Leary) wants the son of a former Brown (actual Texans running back Arian Foster making his acting debut) to be his new star running back. Meanwhile, all Sonny Weaver Jr. wants to do is pick the passionate defensive player that, for some reason, no one seems to care about (Chadwick Boseman). There is a substantial amount of fairy taleness to the story. In fact, coincidence after coincidence helps Weaver ultimately fine redemption once the actual draft roles around. But the conveniences (and utter incompetence of some of the other teams involved) are only noticeable to the purists who follow the draft as much as the analysts on ESPN. There is also a forgettable love story wedged in between Costner and Jennifer Garner that doesn’t really matter. These sins can be forgiven if you’re watching the movie for the right reasons. If you go in expecting to get an NFL fix in the midst of baseball and basketball season or to appreciate the fast paced, wall street-esque world of being an NFL GM, then you’ll enjoy it. Even if the idea of the Cleveland Browns rising from the ashes seems far fetched (Sorry, but I’ll believe it when I see it). Then again… there’s no fault in dreaming. The opinions on Captain America: The First Avenger are mixed. Some found it cheesy and boring. Others basked in the nostalgic feel and endearing story. As my list of the Top 15 superhero movies will tell you, I lean heavily to the latter. But even I can admit that there was something lacking from Cap Part One. After watching Disney/Marvel’s latest venture (I say Disney/Marvel because X-Men, Spider-man, and Fantastic Four are not owned by the same studio), I now know what that missing link was, because Part Two was fully injected with it as if it were the super soldier serum itself. First off, as with all superhero movie sequels, it helps if you’ve seen the previous outings. So don’t sit and watch this film without at least viewing Captain America (2011) and Avengers (2012). 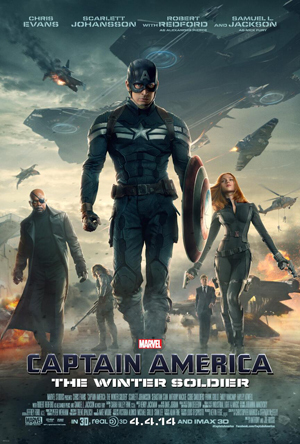 Unlike Iron Man 3 and Thor: The Dark World, this film deals more directly with the aftermath of Avengers, with Steve Rogers (Chris Evans), aka Captain America, now working directly with Nick Fury (Samuel L. Jackson), Black Widow (the visually flawless Scarlett Johannson), Maria Hill (Colbie Smoulders) and the secret agency organization, S.H.I.E.L.D. Series newcomer Sam Wilson aka The Falcon (Anthony Mackie) also plays an effective Robin to Steve Rogers’ Batman. Winter Soldier takes that concept and runs with it as the world of S.H.I.E.L.D. turns on our hero led by organization head Alexander Pierce (Roebrt Redford) and his secret weapon The Winter Soldier (Sebastian Stan). The result is an action packed thrill ride that is every bit James Bond and Mission: Impossible as much as it is a comic book fantasy. The fight choreography is better than anything Marvel has ever done, but the movie also manages to maintain just enough heart to be more than just a comic book Expendables. There are plot turns and surprises that should satisfy diehard fans and newbies while also setting up changes that will ripple throughout the Marvel Cinematic Universe. Make no mistake. The game has thoroughly changed. And Disney/Marvel are the ones who changed it. The recent announcement of Spider-Man movie spinoffs, X-Men movie spinoffs, and Batman vs. Superman are all Sony, Fox, and Warner Bros. attempts to catch up to what Disney/Marvel Studios is already running to perfection. The Marvel Cinematic Universe (Iron Man, Hulk, Thor, Captain America, and S.H.I.E.L.D.) is more than a collection of movies. It’s a live action look into the comic books and cartoons we grew up loving, but on a larger, bigger-budgeted, and more cohesive scale. And if Winter Soldier is a sign of things to come, then Disney/Marvel might as well surgically strap the Box Office Championship Belt to their figurative torso. P.S. : As always, stay after the credits to get a cool look at two new characters coming to Avengers: Age of Ultron next summer.